USA All Stock Monitor allows you to browse all 1900+ public companies stock exchange information in USA(Public, NYSE and Public, NASDAQ) directly.A very quick and easy way to stay in touch with your favourite public companies stock in USA. 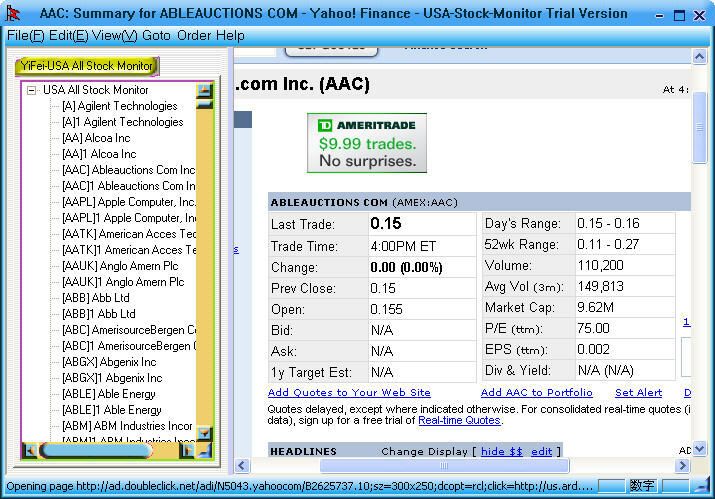 browse your stocks(Public, NYSE and Public, NASDAQ) in just minutes and few clicks. Anywhere in the world! it easy to browse of your investments over the Internet. Gets quotes for stocks, public companies stock Summary, Company website,and other info.
! USA All Stock Monitor allows you to browse all 1900+ public companies stock exchange information in USA(Public, NYSE and Public, NASDAQ) directly. HongKong All Stock Monitor - Browse all 1300+ public companies stock exchange information in HongKong directly.